Scale Model News: WEIRD WHEELS - WHY DOES REVELL SUPPLY THEM? As you may have realised by now, we’re fans of today’s non-cement snap-together kits. For the ham-fisted or time-poor, they’re a great way to assemble a model at the speed of light, yet be able to add some finishing touches - a touch of weathering, say - to turn it into a personalised statement that’s a long way from being a toy. We’re enthusiasts of Revell’s Easykits, especially the Star Wars hardware. 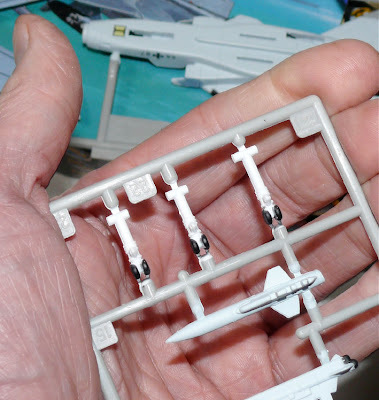 The 1:100 scale aircraft from Revell are reasonable takes on the real thing, if simplified somewhat. 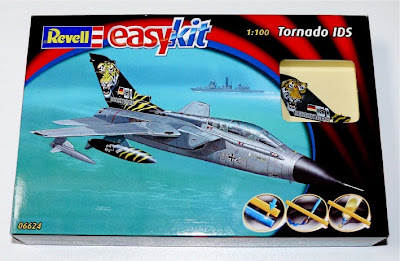 The Panavia Tornado IDS (box, top pic) is beautifully pre-finished in Tiger Meet markings, with a tailfin and rudder that form, quite simply, a small work of art. Components are neatly presented on two runners (middle pic), and need only a little fine trimming when twisted off. The clear canopy is supplied separately in its own bag, so there’s no chance of scratches in the box. 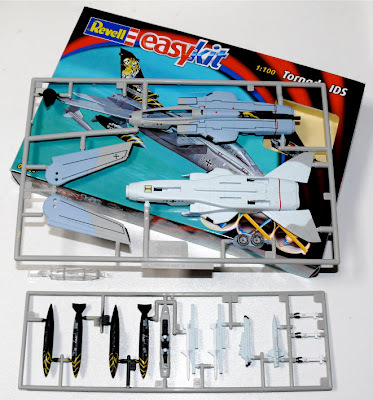 So... after all that care and effort producing the rest of the kit, just WHY Revell, do you supply three crummy bits of inaccurate plastic purporting to be the undercarriage of this Euro-attacker? The parts (bottom) bear no relationship to any aircraft flying today, and what’s worse, are supplied as standard issue with other aircraft in the range, such as the bright orange F-4 Phantom II. It’s bizarre! Of course, assemble this Tornado in cleaned-up flying condition, and it will look just fine, though you’ll have to provide your own stand. Score: Components 7/10, Markings 9/10, Wheels 0/10. There's a good range of Easykits to inspect here.